Hi there and thanks for visiting my website. If you are looking for automatic driving lessons in a calm, relaxed and often light-hearted atmosphere, then feel free to give me a call. Hello, my name is Rob Hayton. 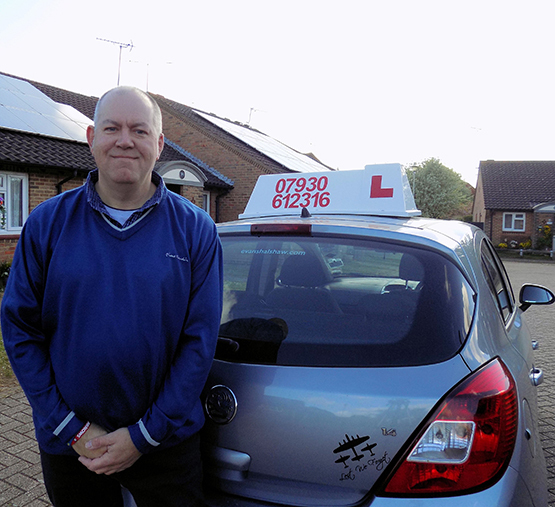 I have been an Approved Driving Instructor (ADI) since 2001 and trained with Luton-based Warden Hill School Of Motoring, working for them until June 2003, when I joined Osborn's School Of Motoring (formerly Colin Osborn School Of Motoring), delivering manual driving lessons, along with fleet driver training and instructor training. In May 2014, I changed to automatic lessons. I then set up Heronswood Driving Tuition in April 2017, where I intend to build on my previous successes, continuing to offer automatic lessons, and hopefully manual lessons in the not too-distant future. I also continue to be on the Register of Fleet Driver Trainers. My interests outside of work are varied, but I'm am a keen amateur photographer & videographer mainly in the fields of WWII aviation and many a summer's day is spent chasing aircraft...! You can be assured of an enjoyable and often light-hearted experience on your lessons with me as I believe that learning should be fun, so you may expect a laugh or two on your lessons, while working towards your goal. Please feel free to contact me should you require any further information. I have a youTube channel, a twitter account and also a Facebook page - just follow the links for more information. Gain confidence and experience in a wide range of scenarios, but best of all you can also gain a significant discount off your insurance premium.